Atlas Model Railroad Co. has Designed This Set of Nickel Silver Rail Joiners To Be Used with Your HO Scale Model Railroad Track. Retail $4.25 SAVE 30% ! awesome works heaps good and so cheap its so worth it and it came not broken really good shipping and came in 5 days(Business days.I hand down rec-emend it. For HO Code 83 and Code 100 track. Nickel silver universal rail joiners. 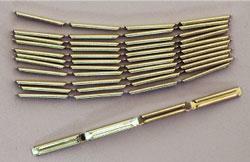 Small metal clips used to join two sections of track mechanically. product was what was expected. didn&apos;t realize there was only 48 pieces in the package. These worked well on my layout and I like being able to connect so many pieces of track at a reasonable price! I used mine with flex track. I bought these to replace a few railjoiners that I had lost from my track, you get 44 joiners in one package which is exactly enough to build 36x81 oval of track. They come unseperated in the package and will need to be cut apart. You can use sidecutters to separate the joiners. Make sure you cut exactly in the middle of each rail joiner because if the tabs on each end are too long it can interfere with the ties. Don&apos;t cut the tabs completely off either as they serve purpose to give support and reduce verticle flex at each joint. The railjoiners fut very snug on code 83 track and provide a superior electrical connection. Also one last note, since they are nickel silver they don&apos;t rust, even outside so they are garunteed to give a great electrical connection for years to come. Rail joiners also come in plastic (ATLU0055) which are insulated to isolate the two sections of track electrically.